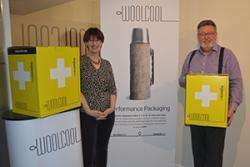 Angela Morris and Keith Spilsbury of Woolcool with the new LifeGuardian pharmaceutical boxes. Research scientists at Bangor University's BioComposites Centre have now helped to further reveal the amazing properties of wool as a cold chain insulation material, to prove its performance in new and valuable applications. Woolcool use 100% pure wool in their specialist eco-friendly packaging products and packaging materials. Their insulated packaging has been developed for use in the fresh food and pharmacology industries, which are reliant on the guarantee that the perishable or sensitive contents maintain a stable temperature while being delivered. 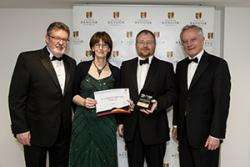 Finalists at Bangor University Impact and Innovation Awards 2015, Keith Spillsbury and Angela Morris of Woolcool with Graham Ormondroyd of Bangor University’s BioComposites Centre and Professor John G Hughes, Vice-Chancellor. "Wool is one of nature's most amazing 'smart fibres', with a complex structure and natural properties that cope with extremes of cold and heat. Wool fibres are hygroscopic, which means they absorb and release moisture, a natural thermostat that maintains stable temperatures. We wanted to use this amazing renewable resource." "Our testing has been able to prove the performance properties of wool as a packaging material and has enabled the company to expand, they now employ 40 people at their new factory. This new material has quickly established its credentials in an important niche market. "The Bio Composites Centre exists to research and develop new renewable materials that can then be developed for market by commercial companies. We're always delighted when a new material is adopted to replace non-renewables materials."